Rep. Devin Nunes, R-Calif., attends a speech by President Donald Trump at the 2018 House and Senate Republican Member Conference at The Greenbrier in White Sulphur Springs, West Virginia, Feb. 1, 2018. The Nunes memo is a four-page document creating a big controversy in Washington, despite few people outside Congress having read it. It has even become the subject of a rift between U.S. President Donald Trump and his FBI director, Christopher Wray. But what is in this memo that is upsetting so many people? Critics of the document say the memo seeks to discredit the FBI and the U.S. Justice Department, which are involved in the effort to uncover whether the Trump campaign colluded with Russia during the 2016 presidential race. In this Nov. 2, 2017, photo, Carter Page, a foreign policy adviser to Donald Trump, speaks with reporters following a day of questions from the House Intelligence Committee, on Capitol Hill in Washington. 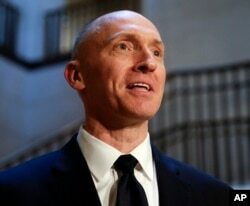 The document was created by staff members of House Intelligence Committee Chairman Devin Nunes, a Republican, alleging the FBI abused its authority to conduct surveillance by seeking a court order to monitor a former Trump campaign adviser, Carter Page. Reports say the memo was produced solely by Republican members of the committee without the knowledge of committee Democrats. The memo, along with a 10-page Democrat rebuttal, was released to the full House of Representatives on Jan. 24. There is controversy over whether the document should be released to the public. Republicans want to, but Democrats and other critics fear it could expose sensitive Justice Department files related to the Russia investigation. Not only could that be an immediate problem, critics say, but it could set an uncomfortable precedent that could make the FBI and DOJ (Department of Justice) reluctant to share materials with the House Intelligence Committee in the future. Rep. Adam Schiff, D- Calif., ranking member of the House Intelligence Committee, speaks at the University of Pennsylvania in Philadelphia, Feb. 1, 2018. 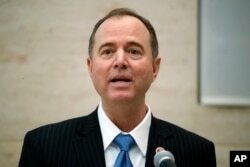 Adam Schiff, ranking Democrat on the House Intelligence Committee, has publicly criticized the memo as "rife with factual inaccuracies" that are "meant to give Republican House members a distorted view of the FBI." Complicating the matter, a U.S.-based nonprofit group that tracks efforts by foreign nations to interfere with democratic institutions, the Alliance for Security Democracy, reported last month that the hashtag #ReleasetheMemo was being heavily used by hundreds of pro-Russia Twitter accounts that regularly spread disinformation. That connection could support the argument that the Republican memo is meant to discredit the FBI Russia investigation. While the full House has had access to both the Republicans' and Democrats' competing papers on the subject, Democrats on the committee have drafted a 10-page rebuttal memo, but the House Intelligence Committee voted along party lines Monday to release publicly only the Republican version, rejecting Schiff's motion to release the Democratic rebuttal. This has prompted accusations that the Republicans are trying to control the conversation by releasing only what information they find advantageous. Republicans also rejected a motion giving the FBI and DOJ additional time to vet the document. The president is tasked with deciding whether the Republican memo should be released to the public or kept secret. Trump has advocated release of the memo in the past. FBI Director Christopher Wray speaks during the FBI National Academy graduation ceremony, Dec. 15, 2017, in Quantico, Virginia. 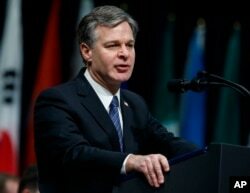 Arguments over the memo have created new divisions in Washington, D.C. FBI Director Christopher Wray on Wednesday openly opposed release of the Nunes memo, saying he has "grave concerns" about the memo's accuracy. As of Thursday afternoon, the document remains under review at the White House. A senior administration official told The Washington Post that the president "is inclined to approve release of the memo today or tomorrow."